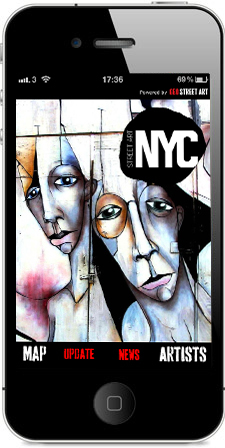 The Geo Street Art Apps for iPhone are street art apps for discovering street art. 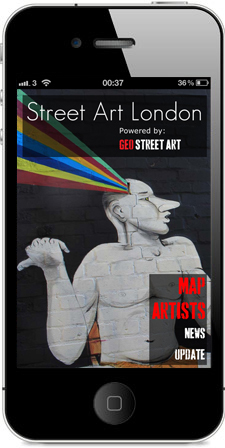 Curated by a global network of experts, working in collaboration with Geo Street Art, the Geo Street Art Apps comprise comprehensive guides to the global street art scene. Locate street art with a regularly updated map with hundreds of locations in each city. Track your own position on the map and filter it by street artist and date. Discover the street art scene in your city. Our apps are a comprehensive resource with thousands of pieces represented, along with detailed information about each street artist. Share your favourite pieces of street art with your friends directly over facebook, twitter and email. 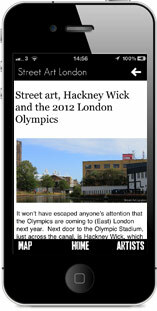 The London and New York City Apps boast over 800 locations between them. The Geo Street Art databases are regularly updated. This piece to the right is by El Mac. It's located on Hewitt Street, Shoreditch, near Geo Street Art HQ! You can easily filter the map by artist and date. Only want to see work by Banksy in London? It's not a problem. Just select Banksy in 'Filter Mode'. You can use any combination of filters that you like and the filters are easily reset. 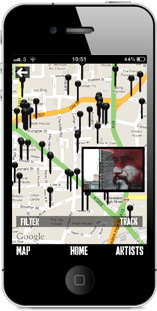 In 'Map Mode', you can track your position relative to the street art locations displayed on the map by activating the tracking functionality. Tracking makes it easier to zero in on the pieces that you want to see. It is easy to turn tracking on and off. Our network updates the databases to reflect the appearance of the new and the loss of the old. Each App always captures the ephemeral nature of street art. To update an App just press the update button on the Home Screen and any new images and/or locations will sync with the app. 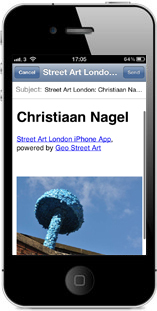 The Geo Street Art Apps for each city feature hundreds of local and international street artists. A huge range of styles and approaches is showcased reflecting the diversity of the global street art scene. Each App is a resource to its respective street art scene as it will continually document and record each street artist's work in the city. To the right is Pablo Delgados’s work in London. 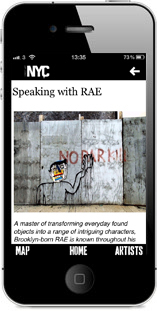 There is a detailed, thoroughly researched biography for each street artist represented on an App. These have all been written by people immersed in their respective street art scenes. To the left is How and Nosm's biography from the Street Art NYC App. It is possible to browse a street artist's work quickly and easily. If the piece that you are viewing is still riding on the street you will be able to instantly locate that piece on the map. 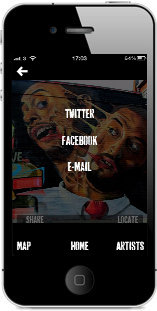 It is easy to share street art images directly from our Apps on facebook and twitter... Images will appear on your facebook profile or in your twitter timeline via clickable links to the image! The piece to the top right is by Chilean native Dasic Fernandez. Dasic has bee living in New York City since 2009 and witihin the past few years has developed a distinct impressionistic style that can be found on murals that grace the walls of the Bronx, Brooklyn and Manhattan. This piece is from the Street Art NYC App and is located at Jefferson Street and Knickerbocker Avenue in Bushwick, NYC. 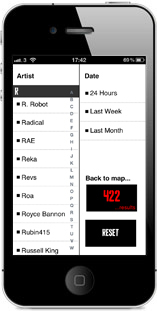 It's also really easy to easy to send images via e-mail to your friends from our Apps. The image to the bottom left being emailed is by Christiaan Nagel. Christiaan is a street artist based in London but originally from South Africa. Over the last few years he has been been popping up bright mushrooms atop buildings, bridges and walls around Shoreditch and Hackney where his mushrooms are now a well known sight. He likens them to 'ideas' which pop up when the environmental conditions are right to produce them. 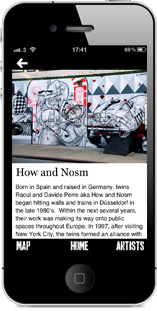 Our Apps also feature the blogs of our curators in each city including the latest street art news, features and in depth interviews with street artists. Street Art London's feature on street art, Hackney Wick and the 2012 London Olympics. Street Art NYC interviews Brooklyn-based street artist RAE. Geo Street Art only works with independent street art photographers and authors who are passionate and knowledgeable about street art and embedded within their respective local scenes. Here are some of the people that we are working with and there are lots more cities on the way! StreetArt NYC seeks to document and showcase the continually evolving spectrum of ephemeral artwork found on the streets of New York City.